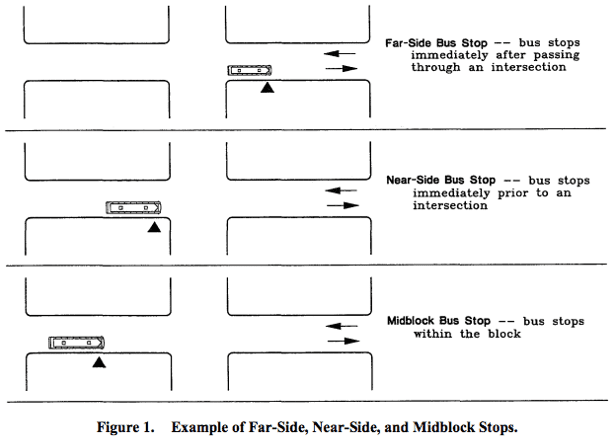 A paper published recently in Transportation Research Record, evaluates the impact of bus stop location on bus stop time and stop time variation. While there is not any safer side as there are pros and cons for the different locations of the bus stops (any suggestions to deny this statement? Feel free to drop a comment), there is a clear winner when talking about efficiency. The study findings show that stop times occurring on the nearside of intersections are on average 4.2 to 5.0 s slower than stop times occurring on the far-side of intersections, with no impact on stop time variation.